This basin sits on top of the vanity surface, with its tapholes in alignment with the drainage pipes. It is one of the easiest to install as this style doesn’t require any tapholes or advanced plumbing in order to be mounted into place. With the rims positioned at waist level it is an ideal option for tall people, as well as a good choice when compensating for any low counters in bathrooms. Consider this the opposite to a top-mount, as this basin sits underneath the vanity’s surface. If you are wanting a minimalist look to your bathroom renovation, this is a great option as it is a very streamlined style choice. If you have a tall vanity this is a great option to reduce adding further height, however it is a fairly complex installation process due to the vanity’s surface needing to be cut to fit the basin. An important note is that you must consider your vanity tops material if wanting to go with an under-mount basin, as some materials may not be suitable. As the name suggests, this basin is fixed directly onto the wall with brackets. With no vanity, this is another great option for those wanting a minimalist look, as well as a great space saver. An important consideration is storage space, though it may save space making it a great option for small bathroom designs you need to consider the loss of storage a vanity offers to make sure it is the best option for you. This is an extra option for anyone who has chosen a wall basin for their bathroom renovation. A pedestal sits between the basin and the finished floors to conceal the plumbing. This is not a support for the wall basin and it doesn’t sit flush to the wall (the finished product will have a small gap). Selecting a pedestal basin is purely a design choice, and so you must consider carefully your bathroom design. This basin is designed to overhang the vanity space, offering much more usable space on the vanity surface. Keep in mind that this will extend the depth of your vanity, which is important to not for anyone with a small bathroom renovation that is tight on space. Think of this basin like a bowl for your vanity. It is quite a unique and stylish bathroom design option, and it can be either top or under mounted (see above) depending on the look you are after. Most vessel basins are made from glass or ceramic materials, but some more exotic vessels can be found in wood or stone materials. It is important to study the space available to you in your bathroom renovation when selecting your bathroom fixtures. 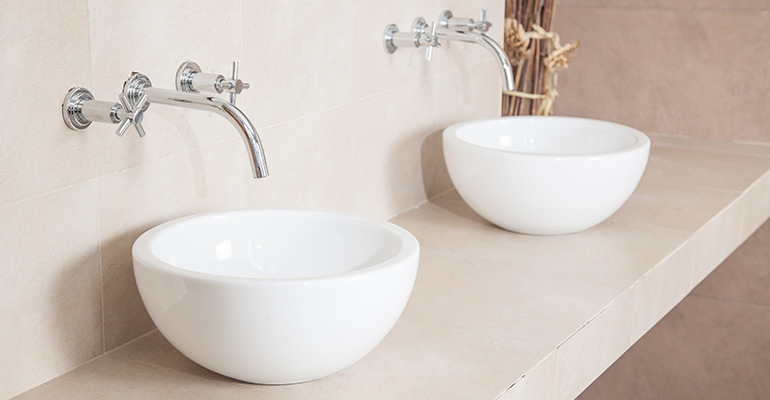 No matter which type of basin you choose, Complete Bathroom Renovations can help. Our Brisbane team have years of experience in bathroom renovations, and can offer expert advice to help you make the best decision based on your space and design choice.